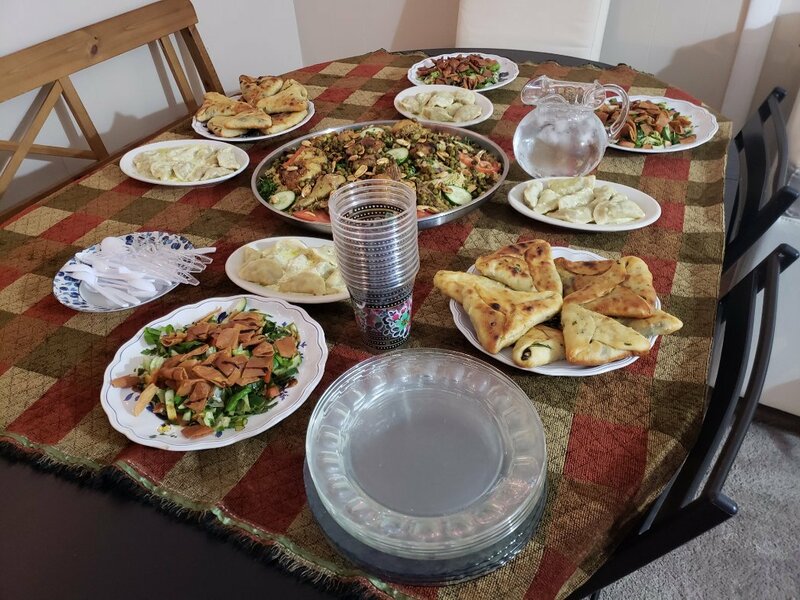 This week-end I dined at a Syrian refugee’s house in New Haven — a special occasion made possible by the homecooked app. I brought along two Iranian friends from my building, so the dinner was a gathering of people from Syria, Iran, Iraq, Pakistan, Peru — and me. The family was from Daraa, the same city where “my boys” are from. 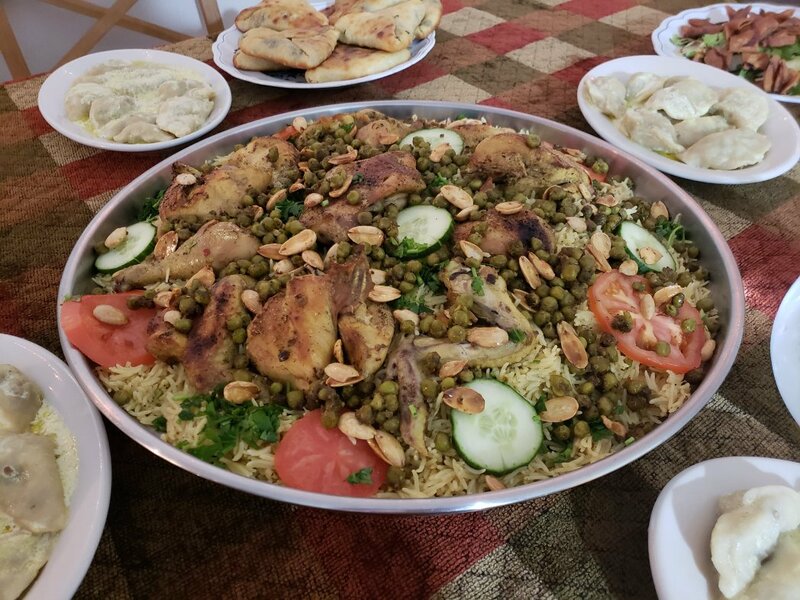 chicken-and-rice dinner is served with fried almonds and peas and cashews. For the meat eaters among us, shish barak was served. 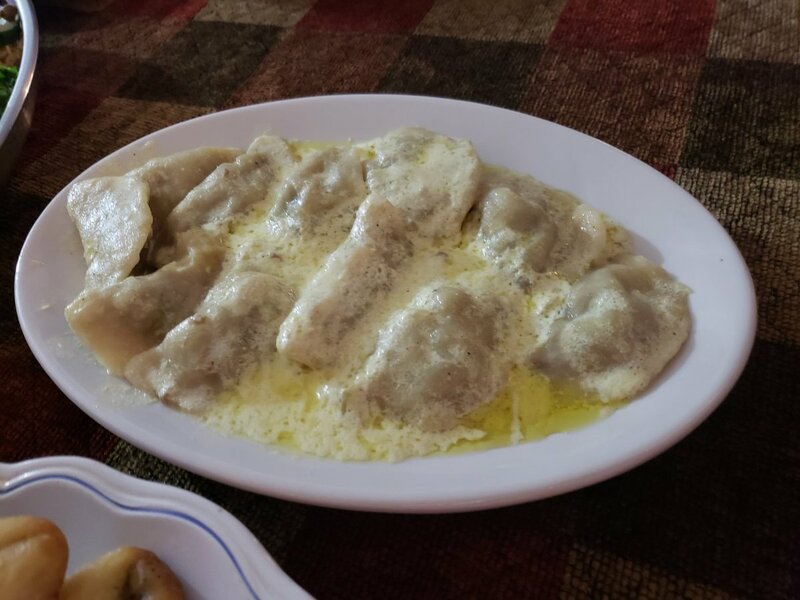 This traditional Lebanese dish made of tiny meat dumplings cooked in a plain yogurt stew was a hit. 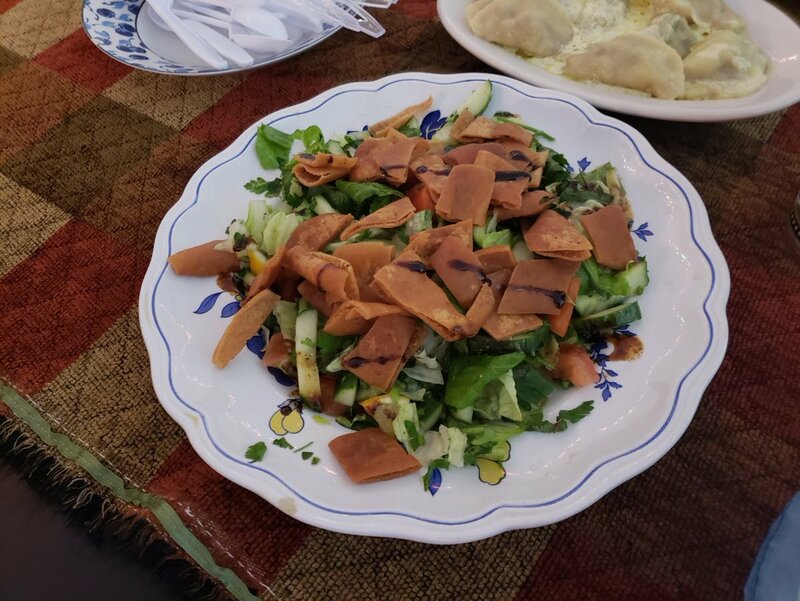 I have tried Middle Eastern restaurants in New Haven but failed to find an acceptable fattoush so it was such a special treat to have homemade fattoush – a Lebanese bread salad made from toasted pita combined with cucumbers, lettuce and parsley (had it almost daily while living for years in Beirut). It was such a delight to speak Arabic and hear about their experiences as refugees in New Haven. 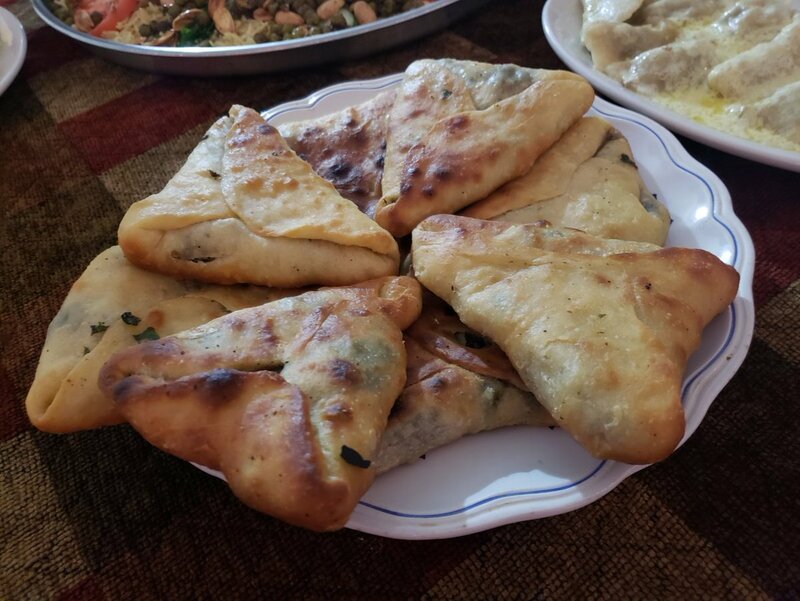 Some comedy: I asked a Syrian teenager what his favorite English phrase is, and he laughed so hard when saying: “No money, no honey.” An Iraqi refugee said the most difficult expression for him to grasp was: “Too good to be true,” since it means the opposite of what it says. When I mentioned how I can’t talk about the refugees I met in Beirut without tearing up, our Syrian host shared that while she was helping fellow refugees for IRC in Jordan, a small Syrian boy who had lost his arms and legs asked her how many years it would take for them to grow back. She can’t get that out of her mind. We carry those stories within us, and it felt like a relief to share our witnessings with others who understand. 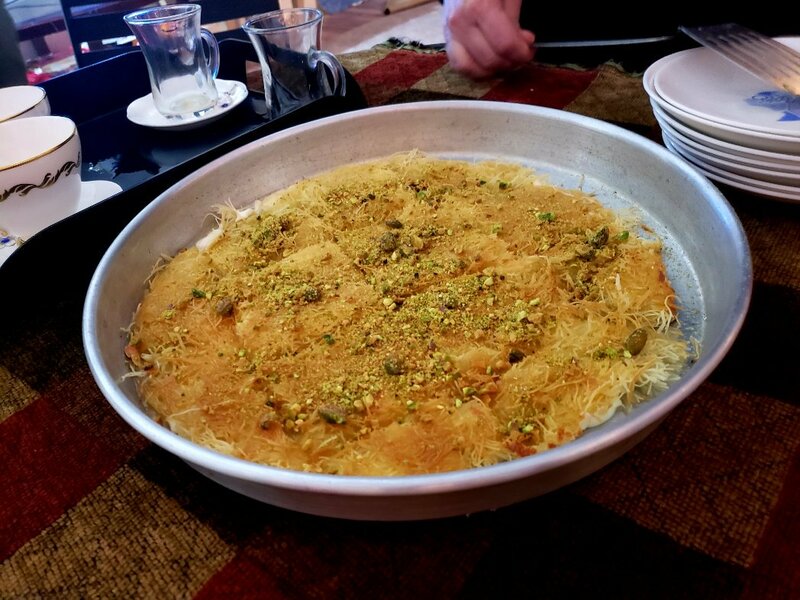 We polished off our feast with Kunafa — a traditional Arab dessert made with thin noodle-like pastry, soaked in sweet, sugar-based syrup, and typically layered with cheese. A sweet finish to our lovely evening together, sharing stories, struggles, and hugs.